Walking through Manchester City Centre the other day, on my way to meet my beautiful sister for a catch up, the sun was shining, the streets were busy with the usual hustle and bustle… and all I could think about was how much I missed… skiing. I know, pretty random? But I did! I was just pining for it. Let’s rewind back to last November, when Crystal Ski organised a bloggers’ taster ski lesson at the Chill Factore at Trafford. A group of us took to the (very baby) slope for an hour to have a go on the snow. 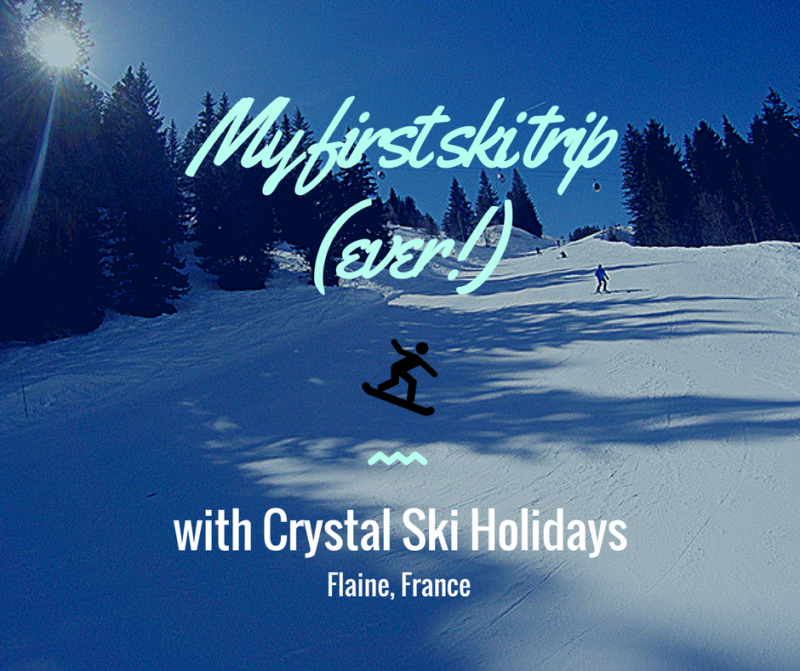 The hour just wasn’t enough, my enthusiasm had been ignited and thankfully, all my wishes came true a few weeks later as I had miraculously managed to win a Fantastic Four trip to the Haute, Savoie, France. Growing up in Saudi Arabia, well skiing wasn’t all too popular over there, for obvious reasons. Moving back to England though, it seemed to be ‘the’ thing to do with the family. I was always intrigued by those who were off to hit the slopes for a weekend, to join their parents in the Alps for a week, to make the most of the season at winter. I had no idea what they did when they got there, couldn’t really understand the appeal of dedicating a holiday to one sport and something that always stopped me from pressing the booking button… it seemed to be the pastime of only the affluent among us. Knowing I was finally about to embark on this ‘ski’ journey, well I was pumped. And scared, of course. I knew nothing about what we were about to do, and people trying to reassure me… well they were quite frankly making things worse! Like I’m not scared of heights enough as it is. I mean, it definitely hit home at that point that I had no clue what I was doing. 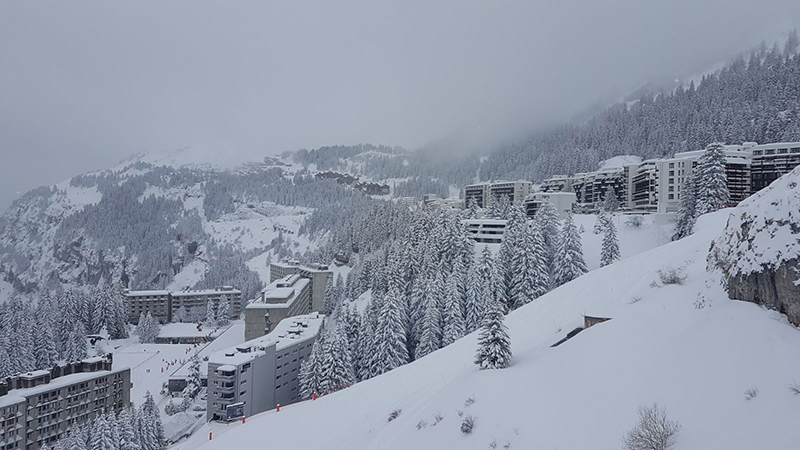 But luckily, Crystal Ski Holidays had sorted everything else, I prayed that they too were taking care of the snow situation. As we flew over Geneva, we passed snow topped mountains, I thought to myself, OK that’s better than nothing, but I’ll admit I was a bit disappointed by the large proportion of the land looking pretty normal. We were in a white paradise, I can’t describe it in any other way. It was still snowing too. We’d heard that we were incredibly fortunate as it had been fairly poor on the ‘dump’ front over the past few weeks and the snow was set to continue. We tried a group lesson, changed to private (more on that later) and we put in time on the appropriate slopes to practice. We found a local favourite for lunch, tried new places for dinner, sometimes opting to stay in and make use of the apartment facilities (which were fab, more on that later too), to cook at home. We started and ended the trip at one of the fancier restaurants, L’Ancolie, celebrating the start and end of what had been a truly memorable holiday. I know, I say that about a lot of my holidays! But you know as well as I do that each one is special in its own way. When I return from places such as Myanmar, Indonesia, Barcelona etc… they are all destinations that I do genuinely want to return to, but it wouldn’t be something I would look at doing a year or so later, there are so many other places in the world I’ve yet to see! Whereas skiing? Yes, this is definitely a type of holiday that requires yearly attention. A kind of holiday which really brings everyone together. A kind of place where even though you can go off and do your own thing for a few hours, there’s always the apres slope meetup, evening times to chill out and fun-fuelled sessions throughout. It’s very much a family thing too, I was mesmerised by the number of tiny tots that were at ski school, dressed head to toe in onesies, tiny skis strapped on, looking tres adorable! And they were usually pretty good too (I can’t even count the number of times a little’un half my size whizzed past me!). We all managed to invent different ways of falling, on and off camera, all equally as funny as the next. I think one of the funniest ski facts I came to realise, is even when I thought I was FLYING down a slope… watching it back on the camera… wow that was totally not the case! Can’t wait to share some of these crazy videos of me sauntering down a flattish-slope-that-felt-as-steep-as-a-cliff. 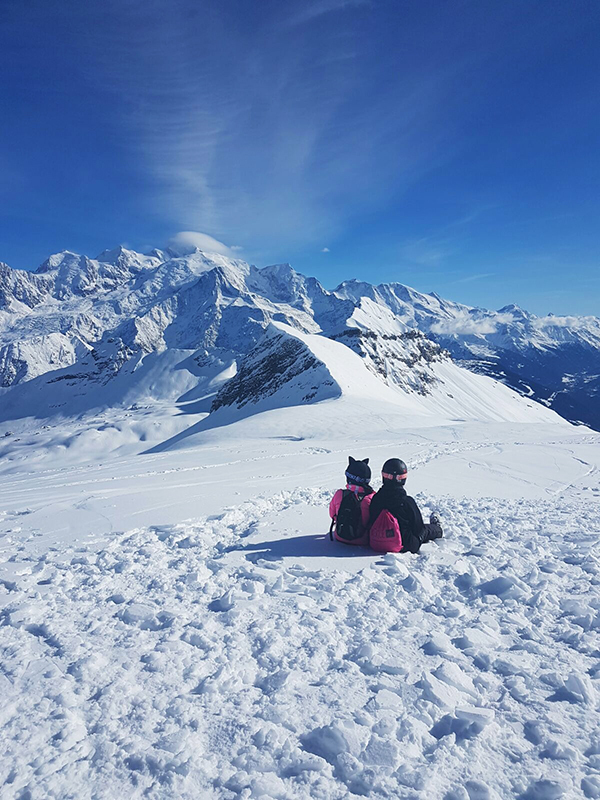 On our final day, my skiing had improved, my confidence was boosted but I wasn’t quite at the right ability to hit the mega slopes. The weather that day, well it was perfect. The sun was beaming down on us as we sat at a new lunch spot on the side of the mountain, with outdoor seating looking down at the view. We were sat stripped down to our t-shirts, sunglasses on, enjoying each others company and planning our final afternoon. G and Dave were going to head up to a new blue and the rest of us decided we were braving the big bubble lift right to the highest point, not to ski down! just to have a nosey. We walked out, past the café, seating area and out into the open, with Mont Blanc right in front of us. Look at that. Doesn’t it make you want to be there? I was there and I still look at it like it’s not real. What a beautiful thing nature is. From the snow beneath us, to the birds around and the mountains in front. It’s a sight like I’ve never seen before. Sitting there on a pile of snow, with my loved ones, I felt very blessed, as did we all actually. It was the perfect way to end our trip, a real vision to fill us all with an affinity to return. We may not have all got to the same ski level, but hey everyone is different. As a group of six, four complete beginners, one mid, one professional – we all managed to have an absolute blast together on and off the slopes. Oh gosh maybe writing this wasn’t such a good idea, I miss it even more now.